Suffering an airboat accident, Stanley and Maggie Cummings leave their mostly unconscious tour guide at an abandoned cabin and wander around Everglades National Park, seeking help. Constantly amazed by the one and a half million acres, complete with dangerous wildlife, they face the greatest challenges of their lives, including one they never expected. 5.0 out of 5 stars A fast-paced, suspense-filled story! Lost in the Everglades is a fast-paced, suspense-filled story, with genuine, likable characters, vivid settings and strong dialogue. Once you pick it up and start reading, you won’t want to put it down! 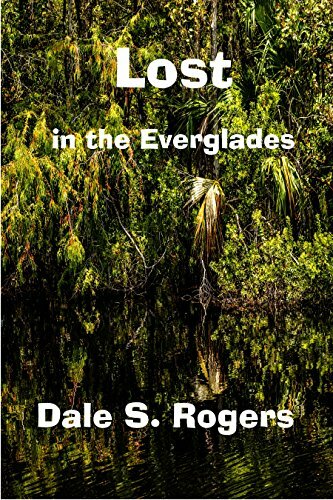 I particularly loved Dale S. Rogers novella LOST IN THE EVERGLADES for it’s fast-paced suspense that kept me on the edge of my seat and the incredible descriptions of the Everglades that were so vivid and rich in authentic detail that I felt as though I was riding shotgun beside likeable characters Maggie and Stanley. I couldn’t put this down and can’t wait to read more from this very talented author. Five Stars! “Lost in the Everglades” draws readers in at a leisurely pace and sets an easily recognizable tone in the excitement at the prospect of leaving everyday stresses behind and traveling to an unfamiliar locale, just as the main characters do. Almost without notice tension sets in, quickly followed by fear and outright panic; it is impossible to stop reading until the fate of Stanley and Maggie Cummings is revealed. Clearly, the author has a working knowledge of the wildlife and ecosystems of the Everglades. She skillfully uses imagery and vivid descriptive details, but not at the expense of realism. No part of the story is so far-fetched that it could not happen in everyday life; perhaps that is what makes it frightening. Pleasantly surprising is that this forty-three-page short story is completely free of profanity and sexual innuendo, a rarity in today’s market. Although the characters in this story are adults, Rogers could make a few alterations and easily expand her fan base to include young adults; YA readers love the type of peril this story offers. Regardless of the audience, it is clear that Dale Rogers is a talented writer with much to contribute, especially for those who are looking for wholesome entertainment of substance and quality. I highly recommend “Lost in the Everglades” to any and all readers. Lost in the Everglades is a wonderful short story. It begins with a married couple, Maggie and Stanley, who take a vacation from their stress-filled life in Philadelphia. They are expecting a relaxing trip to south Florida, but a series of events pitch them into a difficult situation. Their circumstances seem to improve when they meet a man named Sam, but, as the plot continues, they meet with difficulty, then with a life-threatening conundrum. The author seems to have researched the area well. Her descriptions are thorough, and her plot development is masterful. I came to know and then embrace her principal characters. But I most appreciated a plot resolution which blended into positive life changes for the main characters. I highly recommend this short story for those who are looking for adventure in the context of what some would call a “clean read.” It is part of a larger Solstice collection (Let’s Have Fun), or may be purchased individually. Ms. Rogers has a style of writing that puts the reader in the middle of the action. Easily read and savored in a single afternoon or a weekend, it is the story of Stanley and Maggie Cummings desire for a little change of scenery. Be careful what you wish for Maggie. When you are lost in the lost in the Everglades anything can happen. Spoiler alert, it does! There is lots of adventure and action as two suburbanites find themselves pitted against nature in a struggle for survival. There is so much to love about this story. It would make a great movie. I am sure that we will be hearing more from Dale Rogers in the future.